In 2007, bottled water production in the US alone required somewhere between 32 million and 54 million barrels of oil as found by a study published in the Journal Environmental Research Letters. That’s approximately 2,000 times as much as the energy cost of producing tap water. When you’re traveling and without ready access to drinkable water, your first instinct is to reach for bottled water. Pretty soon, your wallet is suffering from that expensive bottled water. And you’re not feeling much environmental love with the plastic bottles you’re discarding. Especially if you’re in a country where purifying your water is a must. The solution? A sturdy, travel-ready water bottle. As trusty and loyal as your best backpack, a water bottle serves as an eco-conscious investment in the earth and your health (Exhibit A: staying hydrated will help stave off jet lag). Keep reading for the best water bottles for travel, either downtown, or around-the-world adventures. We all know that staying hydrated is important. It’s even more important to hydrate while exercising, which is why it’s essential to carry water whenever you head for a workout at the gym, the park, or just around town. One of the best ways to transport water is to carry a water bottle. There are multiple different styles of water bottles, and each has its ideal use. Certain bottles are great for keeping on your desk at work but may not be as convenient for exercising, where you need to hydrate on-the-go and use the bottle with one hand. When choosing the right water bottle, choose one that will allow you to enjoy your exercises much more and be more efficient whether it be a hydration vest, belt or simply a water bottle with a convenient strap to hold in your hand. Water Bottles for Cycling Whether you’re a road cyclist or a mountain biker, staying hydrated while you’re out on your bike is vital. There are multiple ways to carry water while riding and it also depends on the style of cycling you’re doing. For those cyclists riding with a water bottle, you want to choose a bottle that easily allows you to hydrate on-the-go and can be opened with only one hand. The ideal water bottle for a cyclist who isn’t wearing a hydration pack is a one that is made of a malleable material and is easy to handle with or without gloves. Whether you store your water bottle in a jersey back-pocket or use a bottle holder on your bike frame, choosing the correct water bottle size is crucial. A bottle that is too small will move around and can quickly fall out of a pocket or holder. On the other hand, a water bottle that is too large can be difficult to place back in a holder and may require you to stop, causing unnecessary interruptions on your rides. Water Bottles for Running Choosing a water bottle for running is similar to cycling although convenience-wise a hydration belt or vest is often a better choice. While running, it is often beneficial to have your hands available so hands-free hydration systems are more common. Having said that, there are some handheld style water bottles with straps which make them easier to carry. These bottles are often smaller in size and are not ideal for a long run or trail run, but better suited for a shorter or average runs close to home. If you are a trail runner, a hydration vest is a wise choice. Salomon carries a variety of styles that are packed full of convenient features and are designed with comfort in mind. Whether you’re a lady or a gentleman, most hydration vests are unisex styles so anyone can benefit from the convenience of hands-free hydration on the trails. Hydration backpacks are also a convenient option, although it is crucial that you choose wisely. An adequate hydration backpack for running will have a sternum strap which holds the backpack securely and prevents it from flapping around as you run. Most hydration packs will also have small pockets or straps where you can attach a light jacket or keep your house keys safe. Water Bottles for Everday As we all know, staying hydrated throughout the day is essential and one of the easiest ways to do that is to keep a water bottle handy wherever you are. Lucky for you, there are a variety of bottle styles and sizes and almost an endless selection to choose from. This variety of water bottles makes it easier to avoid purchasing flats of plastic throw-away water bottles and invest in a bottle that you can reuse. Having a reusable water bottle is not only environmentally friendly, but you’ll also have it for longer. Brands like Mizu and Hydro Flask offer insulated bottles, which are capable of keeping your water cold nearly the entire day. In the colder months, you can use these same bottles to keep your coffee or tea warm at your desk and eliminate having to leave your station so often for refills even though that refill time is a great opportunity to stretch your legs. If you drink a lot of water during the day, a larger bottle with a 24oz or 32oz volume may be ideal. I personally have a 32oz bottle that I refill multiple times throughout the day in order to stay hydrated at my desk and while I’m at home. While shopping for a water bottle, it is also important to keep in mind the features along with the different activities you’re planning on using it for. If you’re like me and love cold water, ensure the mouth of the water bottle you choose is wide enough to fit ice cubes. If you want a water bottle that’s easy to drink from and won’t spill all over your face, a sports cap add-on may be a wise choice. Some water bottles are even compatible with flat lids that accommodate straws. 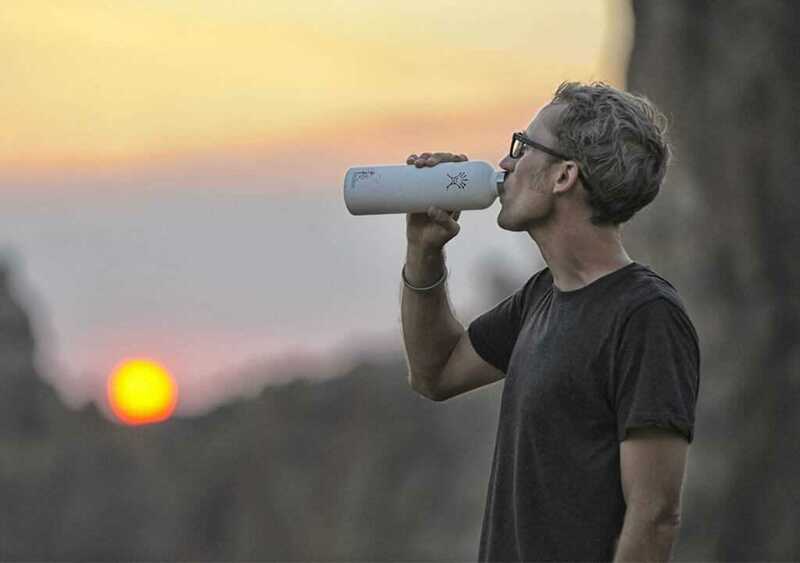 There’s the ideal water bottle for every outdoor activity and daily routine. Leave the plastic throw-away bottles behind and shop for something reusable and long-lasting. Invest in a proper water bottle and your future hydration.